The annual World Day of Prayer service will take place on March 2 at 2:00 pm. The location of the service rotates among St Marys churches and this year will take place at St James Anglican Church. Each year on the first Friday of March ecumenical services with a common theme are organized in 170 countries around the world. This years theme is 'United Under God’s Tent' with a service that was prepared by the World Day of Prayer committee of Paraguay. Mayor Jamie Hahn, St Marys Councillors and senior staff are holding a public 'coffee scrum' this Saturday, February 24 from 10 am to 1 pm at the Town Hall Council Chambers. It is intended to allow public input into the 2007 town budget. Tax rates have increased each of the last 3 years, last year by 4.7%. This will be the first year that the full tax increase caused by construction of the Pyramid Recreation Centre will take effect. This Saturday, February 17 at 7:30 pm the 35 member Redeemer University College Choir will be performing at the St Marys Presbyterian Church. Admission is by donation in support of the choir program at Redeemer. The choir will also be part of the Sunday morning service. Redeemer University College is a Christian university with over 30 degree programs leading to the B.A., B.Sc. and B.Ed degrees. 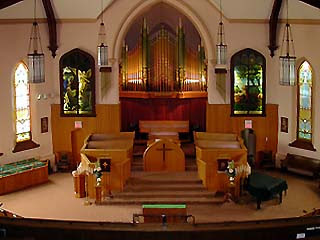 It began offering classes in 1982 and since 1986 has been located in Ancaster, Ontario (now part of Hamilton). Parkbridge Lifestyle Communities of Calgary, Alberta has bought the Thames Valley Retirement Community. 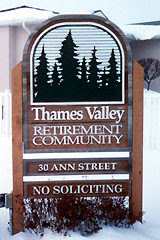 Thames Valley is an adult land lease community off Ann St that St Marys residents Al Strathdee & Diane Furtney began developing more than 10 years ago on the former horse farm of hockey hall-of-famer Teeder Kennedy. The community has 58 houses and has sites for another 6. In a land lease community the residents own their houses but rent the land on a long-term (20 year) lease. In theory residents wanting to move can move their houses but in practice the house is sold and the new owner is given a new 20-year lease. Parkbridge is rapidly expanding and along with Thames Valley announced buying 4 other properties. They now own 60 properties that contain 13,317 sites. Parkbridge already owns the land lease community of Huron Village Green near Exeter, Ontario.